Long Future is one of leading and experienced manufacturers in Taiwan specializing in EVA Foam, Floor Mats, Exercise Mats & other Sports products. Long Future established in 2001, had already possessed over 25 years of shoe-making － EVA Foaming experience prior to the company's foundation. We manufacture pure EVA Foam materials and also perform the further processes to complete EVA Foam Mats, EVA Sporting Goods and EVA Foam Toys etc. We are dedicated on innovations, high-level quality and fulfill customer satisfaction. Long future's EVA Foam has a wide range of applications and can be used in a wealth of products including Soles & Insoles, Floor Mats, Sports Mats ( Judo, Aikido, Tae Kwon Do, Karate, Yoga, Wrestling & Grappling Martial Arts. ) Stationeries, Toys and Heat-retaining Materials. 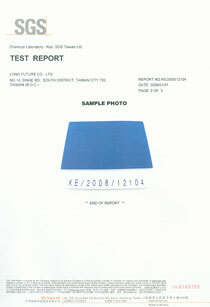 Various dimensions and thickness are available to meet the requirements of different industries. 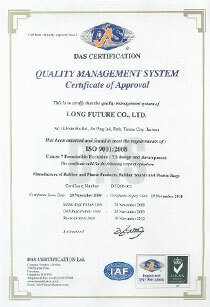 As for our strict quality requirements, Long Future has got ISO9001:2008 quality certification. 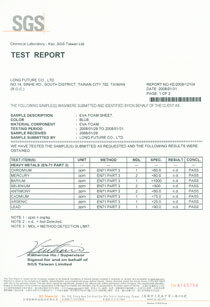 Our non-toxic and environmentally friendly products have passed safety test. We produce quality products to facilitate people's life and ensure extra safety. We have in-time service to grant the best delivery. With years of experience as a manufacturer & exporter, we are confident of satisfying customers with our products & service. To get further information of our products and company, please feel free to send us inquiry from our website at any time. We are at your service all the time.